Does anyone know of a workshop that does dry denting? 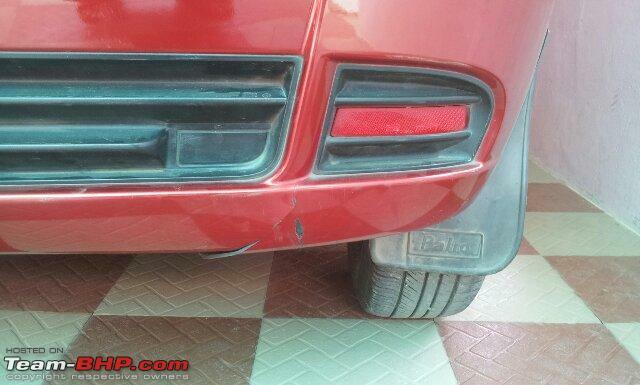 The Accent got scratches and a minor dent while going through a narrow gate. If not dry denting, then can someone please suggest a good conventional denter? Someone who can bring the rear door back to its original color and shape! Will take it to Hyundai A.S.S. if nothing else works out. The Maruti Service Masters : Autoteam is good. Will get you updated if you're interested in taking your Hyundai to a MASS ! Can you please give the contact details of Autoteam? PS: depends on extent of paint damage. Can you post pics of the scratches/dent. Err.. what exactly is dry denting ? Got the work done by MGF Hyundai, Cochin. I must say that they did a very poor job. Not expected from a reputable service centre. They took a sweet week for doing the job, and got the call 2 days later than as was promised. I didn't mind it much, since I would prefer a job well done rather than done in a hurry. First look and I could easily make it out that the job was not executed well (it was as if done by a roadside shop). The colour difference was apparent, and I pointed it out. 1. to my shock, there were numerous scratches (one newly painted parts! ), some of them quite deep! 2.The door which had dent was not finished properly, I could clearly see the uneven surface (when looked from the side) and pointed it out. 3. The door handle was not taken out while painting and the small gap between the handle and the door frame had small droplets of paint - a real ugly work! They asked me to wait for an hour and said they would polish and finish off the scratches and the droplets. In addition to that, they said the Exide freedom battery had conked off completely and they were jump starting it. (Never ever we had any battery problems - it was the original 5.5 years old battery though). We had kept the car unused for days together many times and everytime the car would start without any fuss at all. The long life of the battery may be attributed to minimal electrical extra fittings. I was really cheesed off - wonder if battery can just die like that. Later I replaced it with an Amaraon (extra 5K after giving the old one). I and my bro went out for a walk and when I called them after an hour or so, they tell me that the car won't be ready since some of the scratches were deep. 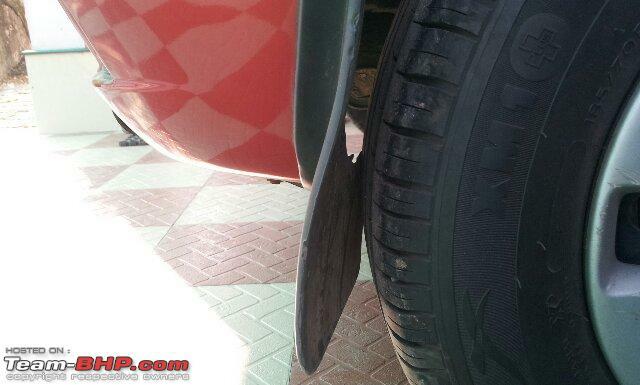 They promised to give the car the next day. They didn't do it either, and I had to leave for Bangalore. Brother later collected the car the next day and told me that the work was not stil upto the mark. The uneven surface of the door remained. They took only 8K insted of 10K (however, I would have happily given that 2K for a perfect work). I think MGF has outsourced painting job. I saw many people not in uniform/without any id around the car when the discussions were on and when the took it back. The unprofessional environment really surprised me. Compared it with Surakshaa Bangalore, where even the M800 gets a professional attention. I think MGF has grown too big. I saw a lot of cars there. Apart from these, they cleaned the fuel filter and did some minor check-ups. They didn't charge anything extra though. Wouldn't recommend MGF for paint jobs. 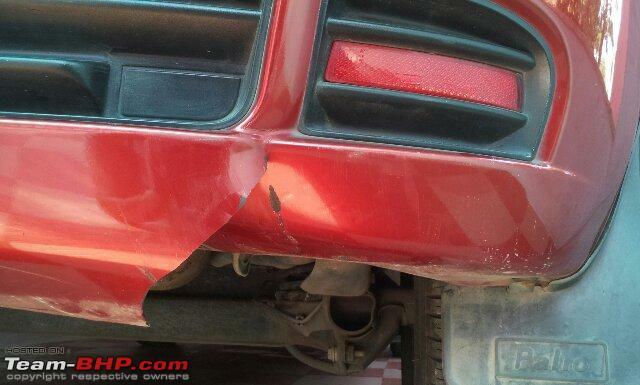 A piaggio ape goods auto rear-ended my Palio yesterday near Trichur. The first rear-ending in 4.5 years of ownership , and I wasn't even hard-braking. Two cars in front had to stop for school kids darting across the road, and thankfully I had maintained distance and could bring it to stop without much drama. But after a second, I hear this bang. 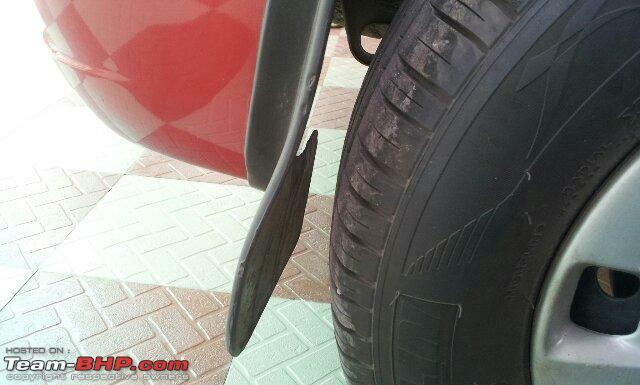 Of course, the auto driver started arguing that I pay for his damaged bumper, and that's a different story. At initial look from the top, I thought it had caused only a minor scratch. But after I got home, noticed the bumper torn in two places near the right corner, and actually pushed inside, causing the muflap to be in contact with the right rear tyre. If I had known the extent of the damage to my bumper, I would have gladly agreed to the repair the rickshaw's bumper provided he agrees to get my bumper repaired! As for the repairs, checked with RF Motors in Kochi where I usually take it for service. They said they were too busy to check this, and need 3-4 days to do anything. Then called Roadians International, near Aluva-Desom on NH47, who did not want to do anything related to a bumper. Then called up the Autoteam (MASS) at Parur Kavala, though I haven't seen them work on non-maruti cars. The guy I spoke too was very friendly and told me that they were a bit busy right now, but when I mentioned about the mud-flap scraping on the type, he readily asked me to bring the car to the workshop to check if they could fix it temporarily. The best part is, Autoteam refused to take any money from me for this work. Will go back next week to get this stitched and painted. Mods: Please move to the correct thread if not appropriate. Thanks.